When Evgeni Malkin went down with an injury March 11 against the Blue Jackets, many opined that it would be the end of Pittsburgh's season. It wasn't a totally ridiculous thought at the time, as the win against Columbus bumped them up to the first wild card spot, and they were about to lose one of their most important players for the rest of the regular season. It'd be hard to imagine how far this team has come since that day without living the rush they've been on. That game against the Jackets kicked off an end to the season that saw the Pens win 14 of their final 16 games to catapult them to second in both the Metro and the Eastern Conference. The Penguins started off the 2016 Stanley Cup Playoffs down to their 3rd goaltender after Matt Murray was injured in the regular season finale against the Philadelphia Flyers, and with Marc-Andre Fleury having already missed the final 5 games with a concussion. Pittsburgh split their opening two games with the Rangers with Jeff Zatkoff in net, looking much less aggressive and effective than the team that tore through the final 16 games of their schedule. Patric Hornqvist kicked off the postseason with a bang, recording a hat trick in the Pens’ 5-2 Game 1 win, but the team wasn’t able to generate the same type of offense in a 4-2 Game 2 loss. Murray was cleared for game action in time for Game 3, and once back he was a key part in closing the Rangers out in 5 games as Murray closed the door on the good chances New York was able to generate and outplayed Henrik Lundqvist at the other end. Putting the exclamation point on a dominant series, Pittsburgh chased Lundqvist from the net in both Game 4 and Game 5 as the Rangers skaters couldn’t hang with the talent, depth, and speed of the Penguins. In 3 games played, Matt Murray stopped 85 of 89 shots against, posting a 1.33 GAA and 0.955 SV% in the process. The offense was clicking too, with Sidney Crosby leading the team in scoring with 8 pts (3g, 5a), Evgeni Malkin right behind him with 7 pts (2g, 5a) in one game fewer, and the bottom of the lineup chipping in with timely scoring as well. Phil Kessel scored 3 goals and added 3 assists, Nick Bonino had 5 assists, and Bryan Rust chipped in with 2 goals and an assist in 4 games. The win moved them onto the Eastern Conference Semifinals, but due to the new playoff format they managed to bump into the Presidents' Trophy winning Washington Capitals, a 120 point regular season team that built up an 11 point cushion over the 2nd best team in the league. 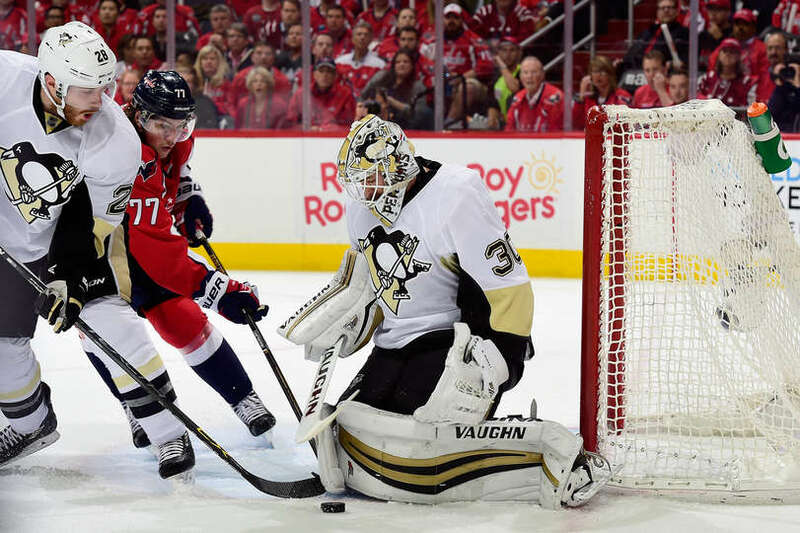 With a high-powered offense and the Vezina Trophy favorite in Brayden Holtby, who had just allowed 5 goals in 6 games against the Flyers, the Caps were going to prove to be a difficult challenge for the Penguins. And it would be the Capitals who would draw first blood with a 4-3 overtime victory. After trading the lead back and forth throughout the game, it would be T.J. Oshie notching the hat trick midway through the first overtime on a wraparound shot that just trickled its way across the goal line. Unsurprisingly, it would be a chippy series between the two rivals, and Tom Wilson started things with a blatant knee-on-knee hit against Conor Sheary in the 3rd period. The play went unpenalized on the ice, and Wilson would only receive a fine from the Department of Player Safety. It was only a sign of things to come. Minutes into a 2-1 Pittsburgh victory in Game 2, Brooks Orpik would concuss Olli Maatta with an outrageously late hit up high well away from the play. He somehow only received a 2 minute minor for interference, but the Department of Player Safety took a tougher stand on the hit, suspending Orpik for 3 games. It was a decision that would heavily influence the next illegal hit to come across their desk, and it would be one that put the Penguins at a disadvantage. In the 1st period of Game 3, Kris Letang would deliver a late hit to Marcus Johansson as he crossed the Pittsburgh blue line. While there would be similarities to the Orpik hit, there were also marked differences. Letang's hit was slightly outside the league's 0.5 second allowance, and Johansson was able to finish the game, a finish it with a career high 9 hits at that. The Pens won Game 3 by a 3-2 score to take a 2-1 lead, but things looked bleak heading into Game 4 without arguably their most irreplaceable player. In fact, most of the hockey world was predicting that the Caps would send the series back to Washington tied. After matching goals in each of the first two period, the teams would play a scoreless 3rd period and head to overtime. But the OT period wouldn't last for long, as Mike Weber whiffed on clearing the puck and it came to Hornqvist in the right circle, and he buried the shot behind Holtby to give Pittsburgh the improbable 3-1 series lead. It was a display of resiliency that came to define the team under Mike Sullivan down the stretch, and it wouldn't be the first time the Penguins would be able to dig down and come up with a big play when it mattered most. The Capitals were able to stave off elimination in Game 5 with a 3-1 win to send the series back to Pittsburgh, where the Pens would build a 3-0. However, T.J. Oshie would get a goal 1:30 before the end of the second intermission to set the stage for a huge 3rd period. Justin Williams would cut the lead to one 7 minutes into the period, then an almost unthinkable situation happened midway through the period. Chris Kunitz would clear the puck over the glass from the defensive zone, giving the Capitals a power play and a chance to tie. To make matters worse, Nick Bonino would swat a puck out of midair over the glass while killing off the penalty, giving the Capitals a 5-on-3 to work with. And though the Penguins would be able to kill off Kunitz's minor, Ian Cole would clear the puck out of play seconds later for the team's 3rd delay of game penalty in just over 2 minutes. It'd be too much to ask for the penalty kill to hold up under that much pressure, and John Carlson would score what appeared to be a back breaking goal that would catapult Washington to a win that would tie the series. But the Penguins managed to keep them off the board and the teams would play their third overtime game of the series. However, in a moment where the team could have folded up and lived to fight another day, the resiliency of these Pittsburgh Penguins shone through in the overtime period. 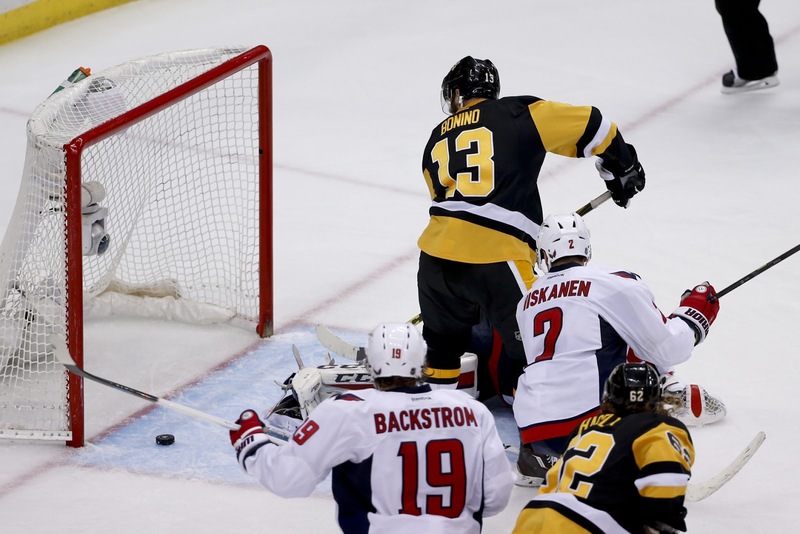 After it took a diving play by Jay Beagle to prevent a Trevor Daley goal, Bonino was able to slide a rebound past Holtby to give the Penguins a spot in the Eastern Conference Finals. If it wasn't impressive enough that the Pens beat the best team from the regular season, they did so on the contributions from their 3rd line while their stars didn't have their best series. The HBK line was dominant against the Capitals, with Carl Hagelin (3g, 4a), Phil Kessel (2g, 4a) and Nick Bonino (2g, 3a) ranking 1-2-3 in scoring during the series. Crosby and Malkin may have led the team in the first round, but each only managed two points against Washington, and Malkin had the lone goal the two scored. It was a far cry from previous years when the Penguins would only go as far as their generational talents would take them, but this team has had a different feel from those in years past. Matt Murray backed up his strong play against the Rangers with another great series against the Capitals, with a 0.926 SV% and 2.40 GAA in his 6 starts. He played so well that even though Marc-Andre Fleury was cleared for game action, and that there were calls for him to resume his place in the net, Mike Sullivan was incapable of pulling the hot goalie from the net. 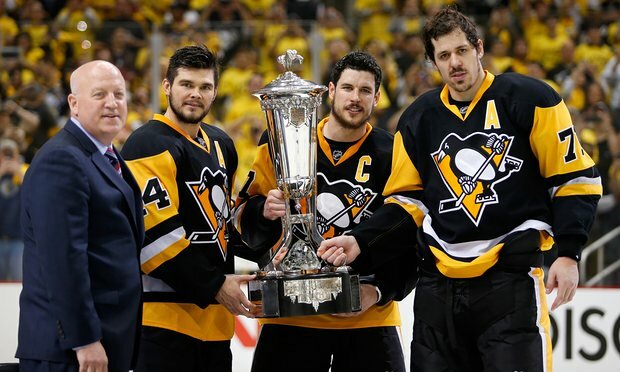 The path to the Stanley Cup Finals wouldn't get any easier at this point, as Pittsburgh would move on from the 2015-16 Presidents' Trophy Winners to the 2014-15 Eastern Conference Champions. The Tampa Bay Lightning would be their opponent after taking the easy way through the playoffs, eliminating the Detroit Red Wings and New York Islanders by 4-1 margins each. It was about as easy of a path to the conference finals as a team could hope for, and many believed that it would be a quick series for the Penguins. However, the Lightning would put that belief to rest in a crazy 3-1 victory in Game 1. Minutes into the game, Ryan Callahan showed that the dirty play wasn't going to be left behind in the Washington series when he raced across the offensive zone to blatantly board Kris Letang from behind. He got a boarding major, though no game misconduct, although he would end up missing Game 2 with the flue anyways. Later in the 1st period, Ben Bishop would crumple to the ice on a freak injury that would see him miss the rest of the series. Luckily for Tampa Bay, he would prove more than capable in net for the Bolts, and at times he would almost single-handedly keep them in games. Pittsburgh would rebound nicely over the next two games with some impressive displays of controlling play, thoroughly outclassing the Lightning skaters on the ice on their way to a pair of victories and a 2-1 series lead. However, despite registering 89 shots on goal over those two games and a decided possession advantage, they managed only a 3-2 OT win in Game 2 and a 4-2 win in Game 3 as Vasilevskiy played outstanding hockey in relief of the injured Bishop. 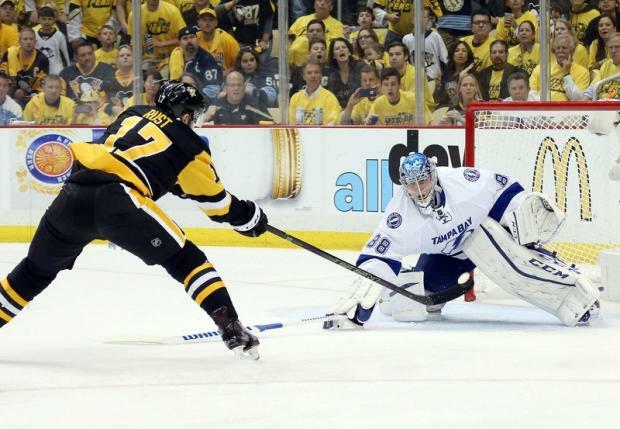 It would appear that the Penguins had put their bad play from the first two periods of Game 4 behind them when they built a 2-0 lead in Game 5, but they'd quickly give it back when Tampa Bay scored back-to-back goals within 1:10 to tie the game. They'd retake the lead with under a minute left in the 2nd on a Kunitz goal, but Nikita Kucherov would score his second of the game to ultimately send the game to overtime, and a Jason Garrison shot that deflected off Tyler Johnson's back would end up in the net behind Fleury and put the Bolts one win away from a second straight Eastern Conference Championship. 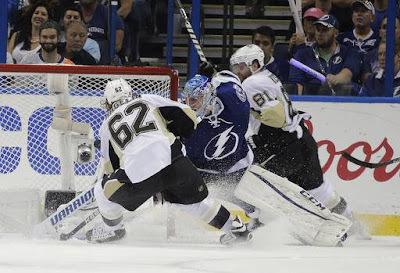 The series would shift back to Tampa Bay with the Lightning having a chance to win in front of their home fans, but the Penguins from Games 2 and 3 would return and dominate gameplay through the first two periods en route to building a 3-0 lead. However, they again began to retreat into a defensive shell in the final period, and they allowed Tampa to claw back into the game with a pair of goals to cut the lead to 3-2. But a Bryan Rust breakaway goal sealed the win, forcing a decisive Game 7 with the Prince of Wales Trophy on the line. And the man who sealed Game 6 was the driving force behind the Game 7 victory, notching both Pittsburgh goals in the 2-1 win. It was truly a team victory in the Eastern Conference Finals, and the team received balanced scoring up and down the lineup. Chris Kunitz (3g, 3a), Evgeni Malkin (1g, 5a), and Phil Kessel (4g, 2a) led the team in scoring with 6 points a piece, while Bryan Rust (3g, 2a), Nick Bonino (1g, 4a), and Sidney Crosby (3g, 2a) were not far behind with 5 points each. And while the stars caught flak from the media after the series against the Capitals, Crosby scored 3 game winning goals in the series and Evgeni Malkin finished off the series with a 5 game point streak. The win was a remarkable turnaround for a team all but dead in December, but there are still 4 more wins left to get to fully complete a truly remarkable season. It won't be an easy series against the San Jose Sharks, as they also boast a deep and talented lineup with offensive talent on the back end and a capable goalie in Martin Jones. The series kicks off Money night in Pittsburgh, and the Pens will need to display more of the resiliency they have since Sullivan took over to finish the job. But the East was won on talent and speed, and they'll need both to win the Stanley Cup for the 4th time in franchise history.